Looking for a new pair of binos, or need to find a gift for your favorite outdoorsman? You need to check out the Bushnell Engage binoculars. Introduced in 2017, Bushnell’s lineup of Engage Binoculars provides a versatile, affordable option for hunters, bird-watchers, and star-gazers. Whether you’re looking for a rugged pair to keep on your dashboard, or a sleek option for those long weekend hikes, it’s hard to go wrong with the Bushnell Engage binoculars. Check out these high-quality features! Bushnell has really stepped up its packaging game, lately. The box is heavy-duty and well-designed. Besides the binoculars themselves, you get an outer storage bag and a smaller, protective bag that also serves as a lens-cleaning cloth. Alongside the protective bags, Bushnell provides lens covers for both front and back lenses. Both of which are easy to take on and off. To keep your binoculars close at hand, you’ll also get a padded, branded strap. The strap is durable and comfortable, but can be a little difficult to install. The sub-frame of these binoculars is magnesium, making the binoculars strong and sturdy, but not ultra-heavy. In fact, these binoculars have just enough heft to make them easy to stabilize, but they’re not so heavy you’ll get tired using them. The tubes themselves have a great hand-feel. Heavy enough for good stability, but light enough to be super portable. They’re really the perfect size for field use. On top of the sub-frame, there’s a rubberized coating on the whole thing. This coating helps to keep the binos safe and from sliding around. So, if you need a pair for on dashboard of your pickup, the Bushnell Engage binoculars are a great option. 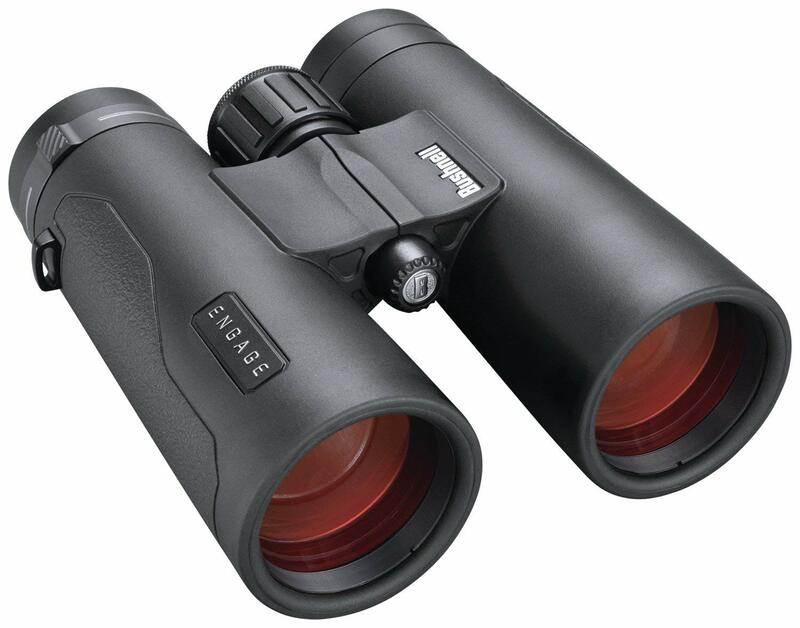 The rubberized coating and strong sub-frame make these binoculars ultra-durable. Drop them on the ground or in a puddle, and you won’t have to worry about anything breaking, getting scratched, or falling apart. If you’re unlucky, though, Bushnell Engage products come with an Ironclad lifetime warranty—for the binoculars, it’s 20 years. Each model can also be adapted to a tripod. The eyecups on the Bushnell Engage binoculars are twist up. This feature allows for easy storage and portability. The eyecups are a little on the thin side, but it’s important to remember they’re not meant to be giant field binoculars. One of the niftiest features of these binoculars is the locking diopter. Understandably, diopters can be a little intimidating and tedious to figure out, but once you have it, you can lock it in place. No need to worry about somebody knocking them over and messing up your focus. All you have to do is pull up on the diopter to adjust, and then push it back in to lock in. With your personal diopter setting locked in, you’ll have a crystal-clear view, no matter what. The Engage binoculars feature multicoated glass with Bushnell’s new EXO Barrier protective coating, which actively repels water, debris, oil, and fog. Don’t worry about your kiddo’s grubby paws getting your lenses dirty, or scratches on the lenses while you’re out in the field. The EXO really helps keep your binoculars clean and your vision sharp even with rugged use. Concerned about image quality? Don’t be. The Extra-Low Dispersion (ED) Prime Glass feature and dielectric prism coating produce high reflectivity, great color, amazing resolution, and fantastic details, even well into dusk and even at night. Engage Binoculars provide precision viewing in the field, on the trail, or from the cabin porch. The depth of field on these are great, too. You can keep an eye on what’s happening outside your main target, which is a really nice feature, and an uncommon one. Engage binoculars are also made with environmentally-friendly, lead-free glass and are fully waterproof. 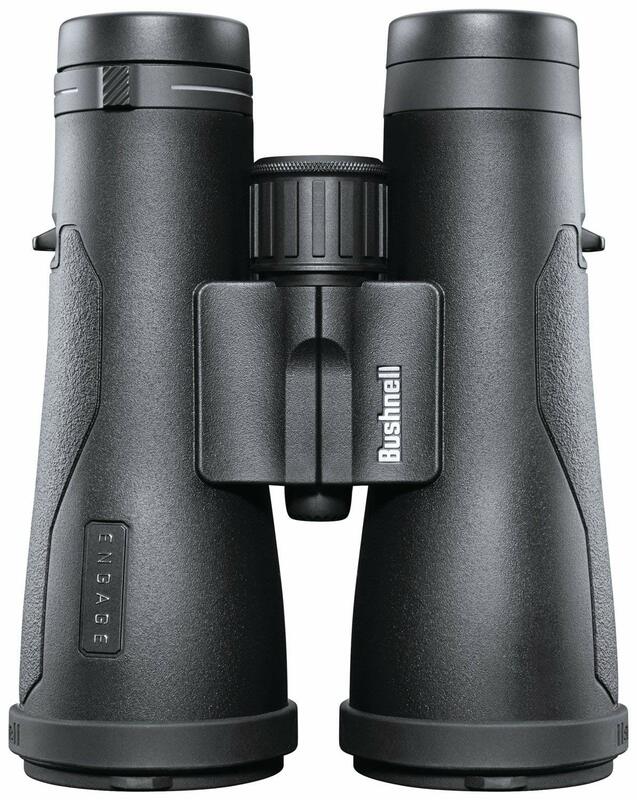 The Bushnell Engage binoculars are truly an incredible value. Their high-quality glass, sturdy construction, and excellent image make these on par with some of the most expensive binos on the market. All the great features roll into a sleek, rugged pair of binoculars that are ready to go to work with you, rain or shine. With their Engage line, Bushnell has proven you don’t need to spend half your paycheck on a high-quality pair of binoculars. The Bushnell Engage line of products includes riflescopes.